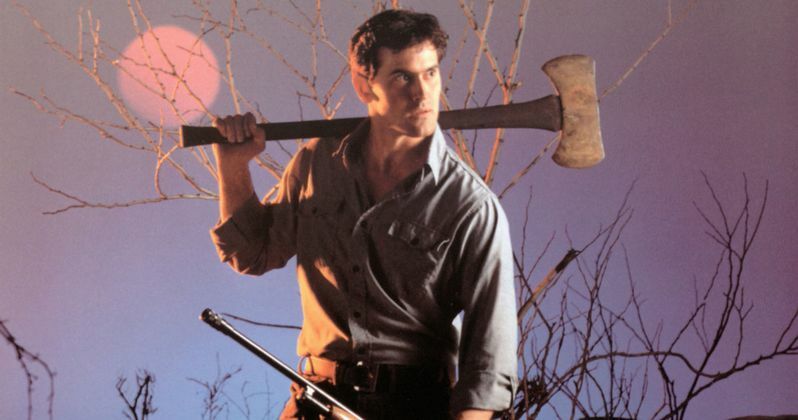 Could another Evil Dead movie happen? It's something that has been discussed, but if it does happen, don't expect Bruce Campbell to come out of retirement as Ash Williams. Producer Rob Tapert helped reboot the franchise with 2013's remake, directed by Fede Alvarez. During a recent convention appearance, he confirmed that talks with Sam Raimi have been happening about a possible new movie. Rob Tapert recently appeared at Motor City Comic Bon where he spoke a bit about the Evil Dead franchise. This come in the wake of https://tvweb.com/ash-vs-evil-dead-canceled-season-3-series-finale/|Starz cancelling Ash vs. Evil Dead. He revealed that they had a great idea for a movie, but that may have been put in jeopardy once Bruce Campbell announced that he was officially going to be returning as Ash. Here's what Tapert had to say about it. "We had a really great idea for where it was going to go in the future, and it was something Sam had been talking about: rebooting a movie. What that scenario could be. And then, Bruce wrote to Sam and I one day, 'If they don't [renew the series], I'm retiring from Ash.' [We asked], 'But wait, Bruce, what about a movie?!' [Campbell noted], 'No, I'm retiring.' So. We'll see." He went on to say, "Sam and myself have been talking about what a new incarnation would be." A new incarnation? That certainly is an interesting thought. Especially considering that Fede Alvarez recently hinted that he actually wants to make an Evil Dead 2 remake after five years. So would this be something else entirely? It's tough to say at this point. Tapert also talked a bit about the cancellation of Ash vs. Evil Dead, which has been heartbreaking for many horror fans. "We knew going into the third season that there was a chance [we'd get canceled]... the ratings had been turning down and it's hard to change that. Starz had been a good partner. Pretty much letting us do anything we wanted. It was probably just not the right outlet for it... but they waited until the ratings came in for the third season. We sold the rights to the first two seasons to Netflix, but they won't let a competitor have something [that's theirs]... which I kind of understand. It's unfortunate." Here's what we know for sure; Bruce Campbell is done with the role of Ash. We also know that Fede Alvarez may make a sequel to 2013's Evil Dead and that Sam Raimi has an idea for a continuation of some kind. So what does that all mean? Really, it means that the franchise is far from dead, it just isn't totally clear what the future is going to look like. This news comes to us courtesy of Comicbook.com.